Even though official results won't be ready until Wednesday, President Rivlin to begin consultations for nominating PM tomorrow. 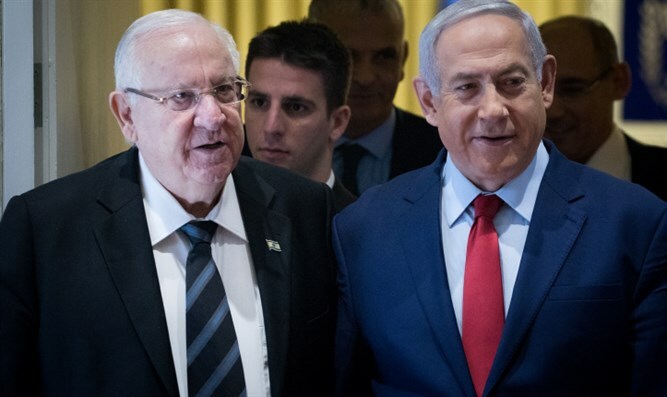 Israeli President Reuven Rivlin will begin consultations for choosing a candidate to form the next government on Monday, the president’s office announced Sunday afternoon, days before the final results of last Tuesday’s general election are released. A spokesperson for President Rivlin said the president would begin consultations with party leaders Monday to determine which candidate is most likely to be able to form a majority coalition government. If one candidate receives the recommendations of 61 MKs or more, the president tasks that candidate with the formation of a government, allotting the nominee for the premiership 28 days to reach coalition deals with enough partners to bring the government up to a majority. The president may grant up to 14 extra days to the nominee to complete negotiations to form a government. The president’s spokesperson said the decision to begin consultations on Monday, two days before the official results are released, was agreed upon by the Central Elections Committee chief, Judge Hanan Melcer. The consultations are slated to begin at 9:15 Monday morning, beginning with the largest party, the Likud, and continuing by order of the parties’ shares of the vote, from the largest to the smallest factions. After meeting with representatives of the Likud, Blue and White, Shas, United Torah Judaism, and Hadash-Ta’al factions on Monday, the president will continue consultations with the remaining parties on Tuesday. Prime Minister Binyamin Netanyahu is widely expected to be tapped to lead the next government, given that the Likud party won a plurality of votes in Tuesday’s election. The Likud is also tentatively projected to be the largest faction in the Knesset with 36 seats, one mandate more than the Blue and White, with 35 seats. Netanyahu also is the only candidate with a clear path to a majority government, with a total of 65 seats (four more than is needed for a majority) going to the right-wing – religious bloc, whose constituent parties were members of the previous Netanyahu government.